As of 3:30PM Thursday November 8 the 2018 SLATE Exhibit Hall is – SOLD OUT! Please email Diane (dianegyorog@awsa.org) to be put on a waiting list AND to make sure you are on our communication list for 2019! The standard booth will be approximately 8 feet deep X 10 feet wide, with a draped back wall 8 feet high, side dividers 3 feet high, one 6’ skirted table identification sign and two chairs. Additional exhibit furniture can be brought in by the exhibitor or requested from Valley Expo Services. A schedule of prices will be included in the exhibitor information packet emailed to all exhibitors in advance of the convention. Shipment of crates and cartons for storage must be prepaid and sent to Valley Expo Services. They will receive, store, deliver the booth, remove and return crates and cartons at the exhibitor’s expense. Further information, including electrical and internet costs, will be sent with Valley Expo’s exhibitor packet. To see more information on the SLATE vendor kit click here. The cost per single booth: $625. Only one company is allowed per purchased booth. If more than one company is found sharing a booth you will be contacted and the second company will also have to pay a $625 fee. Located in the middle of the “action”. Four are available. Please contact Diane Gyorog at dianegyorog@awsa.org or 608-729.6663 for purchase or details. See who has already bought a booth by clicking here! Exhibitors will have access to the exhibit hall for booth installation from 7:00-9:00 pm on Monday, December 3, 2018, AND/OR 7:00-9:30 am on Tuesday, December 4. Tear down starts at 4:45 pm Tuesday, December 4. It is the responsibility of each exhibitor to have the exhibit in place before the grand opening. All property shipped by the exhibitor is at the sole risk of the exhibitor. The exhibitor agrees that the Association of Wisconsin School Administrators, Wisconsin Association of School District Administrators, Valley Expo Services and the Kalahari Resort, and any of the officers, staff members, agents or employees are not responsible for, and are released from, all liability as to any injury, loss or damage that may occur to the exhibitor, the exhibitor’s agents or employees, or to any other person or to the exhibitor’s property during or subsequent to the holding of the SLATE conference. Looking for a way to showcase your products? 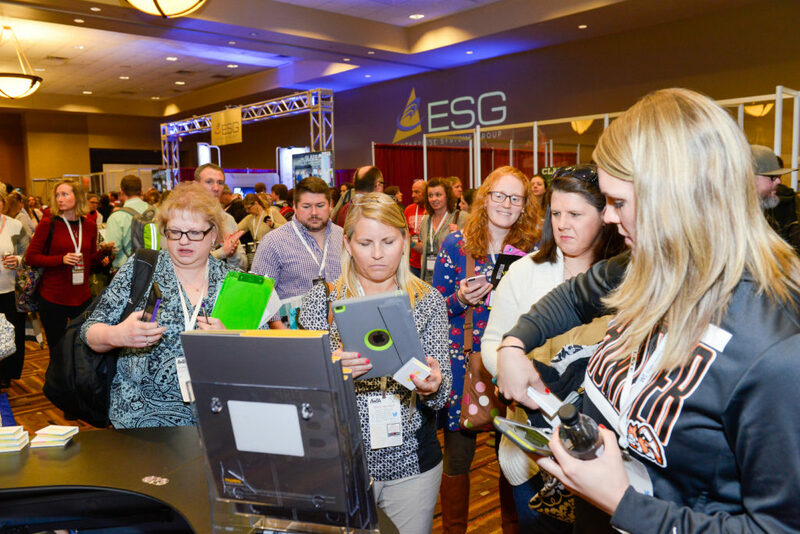 Register for SLATE’s Exhibit Hall Session Theater Showcase. The theater, located in a large section of the exhibit hall, provides the opportunity for presentations and demonstrations of the ways in which our students and schools can use technology tools to advance learning and make educators’ jobs simpler so they can focus on teaching and leadership. You can register for one of these sessions as part of your exhibitor registration. Please Note: These are not “sales pitches”; rather they are presentations that will provide valuable information about your chosen product/topic. Limited to 9 presentations. They do sell out fast so register early! Click here to see all of SLATE’s sponsorship opportunities! Every year, over a thousand superintendents, principals, IT, and other school leaders attend the SLATE Convention. There is no better way to familiarize your business or organization with these school decision-makers than to exhibit at SLATE and advertise in our Program. As an exhibitor at the SLATE Convention, we welcome and encourage you to advertise in our SLATE Program. Ad space is limited. SLATE Program This publication is the comprehensive program of our SLATE Convention. It is distributed to all attendees and presenters. It serves as a directory of the Convention with reviews of all sessions and listing of each exhibiting company with its booth number. The ad is due October 1. All payments made to SLATE/WFEA under this application shall be deemed fully earned and non-refundable in consideration for expenses incurred by SLATE/WFEA and SLATE/WFEA’s lost or deferred opportunity to provide display space to others. For additional questions or concerns regarding this cancellation policy please contact AWSA at (608) 241-0300. Items or services of substantial value. Anything of value that could reasonably be expected to influence the official’s vote. Anything of value that could reasonably be considered a reward for official action. A local public official may accept meals, refreshments and the like without charge that are provided, sponsored, and/or sanctioned by the conference organizer. For complete information, please reference Wisconsin Ethics Law.